The second thing I did was to install my heating device which is just a plain old lamp kit that I bought for $10 at Lowes. I drilled a hole in the middle of the bottom section as close to the ledge as I could get. Then I inserted pulled the cord through and hooked up the lamp fixture. I slid the shaft of the fixture back through the hole and the insulation in the wall of the cooler held it in place. I may add some spray foam to make it more secure. 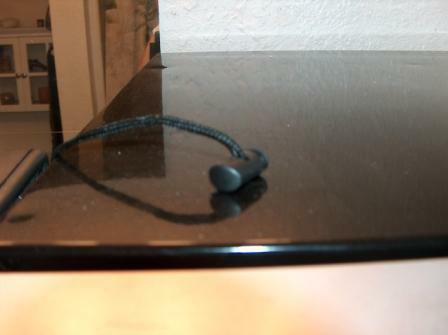 I then plugged it into a ReptiTemp 500r that I bought online for $33 including shipping. It is a "plug and play" thermostat that has a dial you set to the desired temperature. It works great! So much easier than the dimmer switch I was using. 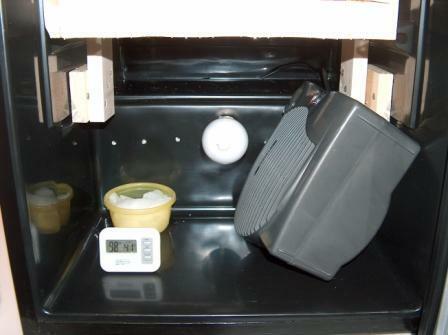 I attached the thermostat to the side of the incubator, then plugged it in. 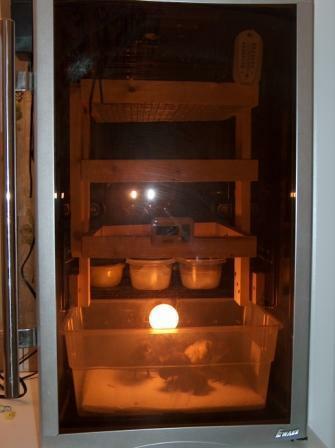 I put a thermometer at the top and bottom of the incubator so I could tell if it was getting too hot in either side. 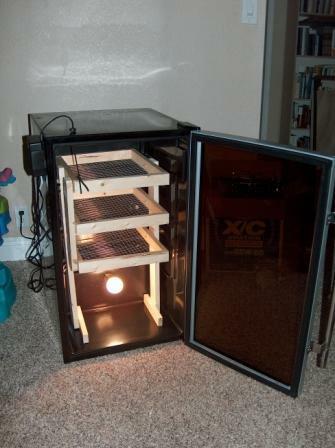 I also put a small electric fan at the bottom to circulate the air and keep hot spots from occuring. There are 12 3/8" holes across the back for air vents. Here is my finished project! You can see from the picture above that I originally put feet on the rack, but it was too wobbly. 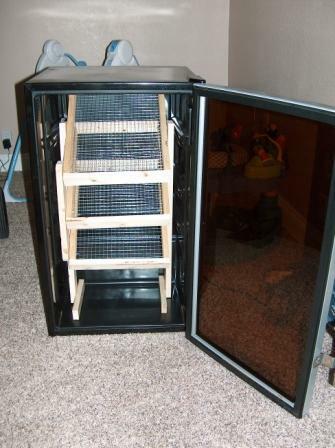 I decided to make it more permanent in the incubator by screwing a spacer board on each side, then attaching the rack to them as you can see in the picture below. I will probably install my computer fan in the top for circulation instead of the big fan, but the computer fan was in use when I put the new one together. 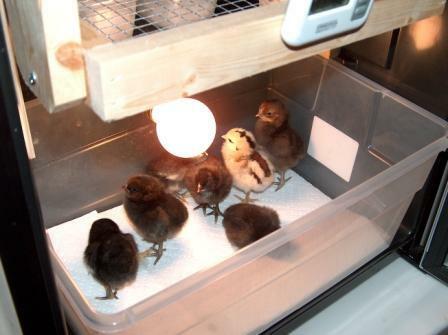 I will also have a large plastic tub at the bottom for hatching eggs and chicks to fluff up in, where they will be safe. With the total cost of this project at $58, I am very pleased with the outcome! 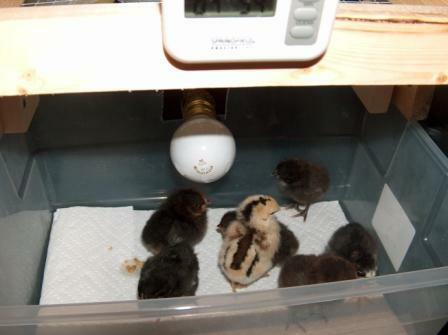 I have 4 small children that are 5 years old and under, so the see through tub and front have been wonderful for them to watch the action without causing any problems with the incubator or giving Mommy a heart attack! It has been a breeze to clean since all the surfaces are plastic and I can just wipe them down and move on. 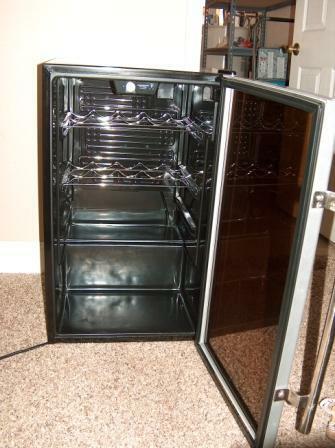 That was one of the main reasons for wanting a mini fridge incubator. 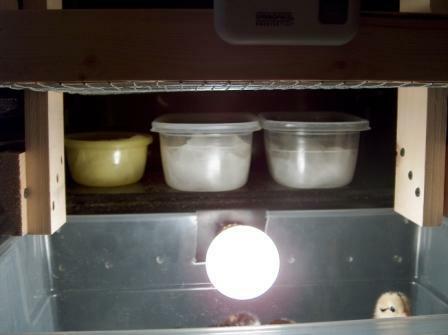 As most of you know, cleaning styrofoam is a major drag (my first incubator is styrofoam)! 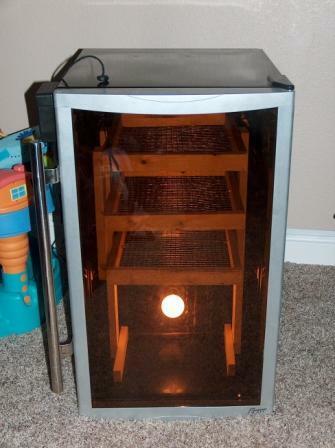 Well, I hope you enjoyed my pictures and the outcome of this incubator. If you have any questions or suggestions don't hesitate to PM me! I'd love to see the detail on the shelves in this article. I'm interested in how the reptitemp works? Is it plugged into the light and the light wired to the thermostat?